Book Review Printed in Germany By Christopher Williams Reviewed by Adam Bell Christopher Williams is an acquired and erudite taste. His dense and discursive photographs tell complex stories about their subjects and production, which are both immensely pleasurable and maddeningly obtuse. Similar in many ways to The Pictures Generation, who are his rough contemporaries, Williams occupies a unique niche. Printed in Germany. By Christopher Williams. Walther König, 2014. 372 pp., 138 color illustrations, 8¼x10¾". Christopher Williams is an acquired and erudite taste. His dense and discursive photographs tell complex stories about their subjects and production, which are both immensely pleasurable and maddeningly obtuse. Similar in many ways to The Pictures Generation, who are his rough contemporaries, Williams occupies a unique niche. Stubbornly hermetic, Williams utilizes both appropriated and rephotographed images, as well as his own photographs and those by professional photographers. Although drawn from a variety of different sources and taken by various photographers, the work maintains a uniform, detached, commercial look. The second volume in a three-volume catalog, Printed in Germany not only playfully deconstructs the exhibition catalog but also questions the language of photographic representation and exposes the knotty reality that informs and supports the images that surround us. Printed in Germany. By Christopher Williams. Walther König, 2014. Since the 1980s, Williams has used the language of advertising photography, as well as a variety of photographic conventions, to create richly encoded images that foreground their own artifice. In each carefully crafted image, Williams lays bare the flaws of these visual models, while also directing ones attention to the expansive social, economic, and political forces that bring these images into being and sustain them. Loosely linked, Williams’ work includes variety of different subjects, including apples, smiling models, bisected cameras and lenses, overturned Renaults, and intricately stacked and sliced Ritter chocolate bars. Each image functions as its own visual essay with a non-inferable backstory or rationale that is often alluded to in the long, detailed descriptions of the images. In one case, a hovering tire points to the production of rubber in Vietnam, as well as the Vietnam War and possibly the remnants of a colonial empire. 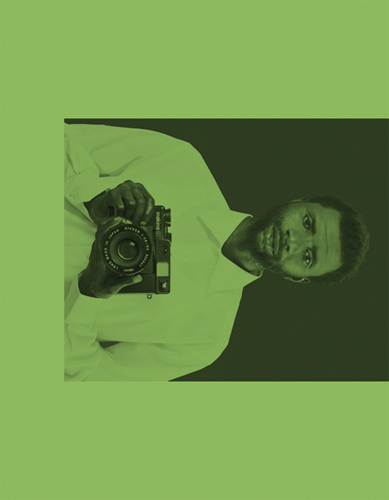 In another image, an African man from Gambia, wearing a crisp white German shirt, holds a Plaubel Makina, a German camera, which was later manufactured in Japan. Beyond suggesting a complex international chain of economic links, the exact meaning behind all these details remains unclear. Pristinely rendered, Williams’ work offers its own aesthetic pleasure, but is always asking us to look deeper. Whether we choose to follow is up to us. Like Williams’ corresponding retrospective, whose true subject is the exhibition form itself, the book is and is not the true subject of the catalog. As Williams recently stated, the multi-volume catalog “really becomes a model of a book, rather than a survey catalog.”[i] Stripped of text, Printed in Germany self-consciously plays with the book format. Images are abruptly cut off in the gutter, only to appear again in the next signature or spread, and occasionally run off the page. Depending on the version of the book you choose, the book is also filled with sections of green, red, or yellow monochromatic paper. In one case, an image of a bisected lens appears on one of these pages, but they are otherwise blank and function as both pauses and ruptures in the book’s flow. The gaps also remind one of spaces typically held by catalog essays or text. This possibility is underscored by the empty pamphlet that appears in the back of the book. Printed in Germany, so named for the only text printed onto the back cover of the pamphlet, is the second volume in a planned three-volume catalog accompanying William’s travelling retrospective. The first volume, The Production Line of Happiness, is a comparatively slim book and principally contains essays from the curators at the three institutions that hosted the show: Mark Godfrey, Roxana Marcoci, and Matthew S. Witkovsky. Interspersed in the book are other reprinted texts, including a talk Williams gave on the artist John Chamberlain, a piece by Barbara Kruger, and text by Claes Oldenberg. Whereas The Production Line of Happiness outlines William’s creative lineage and output, Printed in Germany foregrounds the pictures,. The third volume, not yet named, is slated for 2015 and will contain all of the artist’s copious image captions, installation shots from all the venues, and transcriptions from symposiums that took place during the show. Although the third volume has not appeared, the first two volumes recently won the prestigious Aperture Book Award for the Best Catalog. In some ways, it feels incomplete to discuss only the second volume, especially since all three are so closely tied. Despite this fact, this image-centric volume will clearly appeal to those who prize Williams’ images above their complex back-stories.